Firstly: the decor is AMAZING! It's very warm and includes an eclectic collection of intriguing decorations, even the wallpaper had me staring. Our table was incredibly private, a little room all to ourselves which was lovely. I particularly liked the giant paper chandelier and a theatrical cat mask which embellished the swirly patterned golden walls. Even the bathroom was beautiful! The cafe doesn't serve savoury food, but instead creates beautiful chocolates, cakes, macaroons, ice cream and sorbet; as well as a vast collection of unique hot drinks. I decided to go for the option of four macaroons for £3.50 - roughly the same price for a slice of cake! The fun flavours included raspberry, lemon, cinnamon & honey, blackcurrant and Ecuador chocolate. All my macaroons were a melt-in-the-mouth texture and full of flavour. My family decided to go for the vegan hazelnut chocolate cake, carrot cake and my mum tried out their ice cream. It's fair to say all of us thoroughly enjoyed our treats. My dad even said it was "good" and "moist" which is a huge compliment coming from him - he's a bit of a connoisseur when it comes to carrot cake ;). 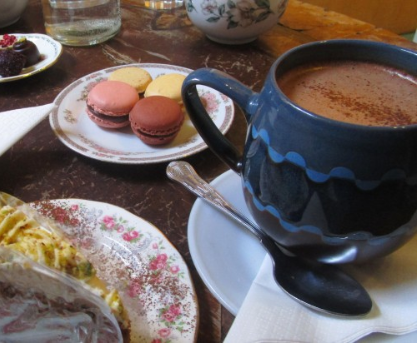 As for drinks - I was delighted when I spotted Chai Hot Chocolate on the chalkboard menu. Chai lattes are a favourite of mine and since it was Chocolate Week I decided to try out this variation. Two of my favourite things in one drink resulted in amazingness! If you'd like to browse and even purchase from their diverse range of hot chocolate flavours, click here. I am itching to try the Rose & Vanilla! But it was just too good to resist! The Chocolate Tree has a fantastically fun atmosphere with friendly and attentive staff, not to mention the scrumptious range of food and drink for whenever you want to relax and indulge in all things chocolate! To all chocoholics out there - I have found our haven (yes, it's really that good). You're welcome.